Füssen is a small picturesqe town in south-east Germany which lies on the Austrian border. It is situated in the Allgäu region of Bavaria. The first thing you notice is the surrounding mountains, the clean fresh air and the beautiful blue-green of the river Lech. It is accessible by train from Munich. Füssen is also a well known Kurort and lies at the end of the famous Romantic Street (see picture above). There are so many things to do and places to see as a tourist and when it comes to accommodation there are many choices. 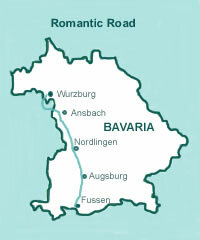 The Romantic Road, also called the 'Romantische Strasse' begins at Wurzburg and comes to an end in Füssen. It gives tourists the chance to see many small Bavarian towns along it's route and experience their culture. A good example would be the Wurzburg Palace or the castles of Schwangau. Füssen has a beautiful lake called lake Forgen or 'Forgensee' on which you can take a boat ride. There are also other great lakes to swim in, nearer to the castles of Schwangau. The Lech river bridge is also not to be missed, the beautiful blue colour of the water is amazing. If you like architecture you will love strolling through the pedestrian zone as the buildings are in old Bavarian style. There are some great tourist shops and even great ice-cream stalls! There is also an indoor swimming pool and a cinema within walking distance of the main town centre. The town of Füssen is a well-known 'Kurort'. Kurort is the name given to places which have excellent air and water quality. The Allgäu region of Bavaria is very famous for these green hotspots. German tourists flock to these towns as part of a wellness holiday break. There are numerous wellness activities such as hillwalking, swimming in the mountain lakes and cycling the many forest and lake cycleways. The town of Schwangau is about 2 miles away and is home to the two very famous royal castles. You can rent a bike in Füssen and cycle there. You can even walk if you wish. Alternatively, you can take the bus to Schwangau from outside Füssen train station. These buses are quite regular. Built by King Ludwig II, the Neuschwanstein castle is an amazing sight so bring your camera! The climb to the castle is tough enough but you can get a horse and cart up to see them if you don't fancy the walk. Hotels: - There are really great guest houses and hotels. The Hotel Sonne lies at the corner of the main shopping district, 5 minutes from the train station. Another hotel just accross from it would be Hotel Hirsch. See www.hotelhirsch.de for more information. Youth hostel: - For backpackers there is a really nice youth hostel within walking distance from the train station and town centre. Contact details are: Jugendherberge Füssen, Mariahilferstr. 5, Tel. +49(0) 83627754. Camping: - If you would like to camp there is also the possibility. There is a really good one which lies on Hopfensee (Hopfen Lake). It has all the necessities such as water, electricity and even internet connection. Camper van: - alternatively, if you are travelling by camper, there are halting sites for overnight stays. For more information on accomodation see Füssen's official website at www.tourismus-fuessen.de.